Bonnie VanAmburg sent this photo from the 2006 DCI Classic Countdown. Here is a photo taken on April 26 after watching the 2006 DCI Countdown Classic in Ithaca, N.Y. These are Alumni members of the Squires Drum and Bugle Corps from Watkins Glen, N.Y. Bonnie (Armstrong) VanAmburg is also an alumni member of the Bucktail Regiment Drum and Bugle Corps from Emporium, Pa.
We all had a great time together. After the show, we all stood around talking and no matter how many years it's been since we've seen one another, we're never lost for words. That drum corps family bond has us connected together for life. Plus you have the great pleasure of meeting and talking with others who share the same love—drum corps! 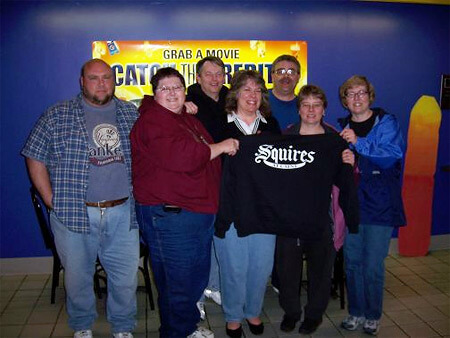 From left to right: Jeff Magacs, Bonnie (Armstrong) VanAmburg, Rich Carland, Lori Clark, Ed "Porky" VanAmburg, Carol (Calhoun) Naylor and Judy (Calhoun) Murawski.